Some objects have an appeal that takes them far beyond mere function. The Corona 3 folding typewriter is just such a device. It had a long list of celebrity adherents, including Ernst Hemmingway and Jack London. It was a typewriter that appealed to executives as well as clerks, authors and presidents. It could be found not only in offices, on trains and in hotel rooms, but also on World War One battlefields, up mountains and on jungle expeditions. It was also the first commercially successful typewriter and retained its appeal for nearly thirty years after the first one was made in 1912. The Corona 3 has been wrenched from obscurity to become a highly desirable and fashionable accessory. People are now using them to type wedding invitations or at the reception itself to enable guests to type good luck messages for the bride and groom. It is making its way onto the set of television programmes. Henri Leclair, the suave French man who is head of display in the ITV television series 'Mr Selfridge' owns one. The Corona 3 is likely to rise in value significantly in the next few years. This particular model, like all Corona 3s, was made in a factory at Groton, just outside New York. When it was made in 1915 it was the high tech gadget that everyone wanted. There are strong parallels with a modern ultra portable laptop. The Corona 3 is finished in a shiny black high tech looking colour. To use the device you take it from its purpose-made case, fold back the carriage, just like you would unfold the screen on a laptop, and you are ready to work. Both laptop and typewriter are as light as the technology would allow at the time, with the Corona having an aluminium body. Aluminium was a new material at the time and helped bring the weight down to just over 6lbs. The type bars and mechanical parts were made from steel for robustness. Coronas had a reputation for toughness as well as portability. The Corona 3 saw active service in World War One, with both the British and French armies ordering large quantities of them. Back in 1915 a businessman away from the office would have found the Corona the answer to his prayers. Business correspondence was done by typewritten letter. Handwritten notes were unprofessional. If you were away from the office how could you communicate? The Corona 3 was the answer; it was light to carry and you could make sure those important letters to clients got sent when you were away, just as you can with email today. I can tell this particular Corona was made in 1915 by the serial number. It also bears some gold lettering which says that it was supplied by Taylor's Typewriter Co Ltd, 74 Chancery Lane, London, WC2. Chancery Lane is in Holborn and the phone number is Holborn 3793. With a little bit of research I found that Taylor's had a different telephone number in 1915, so this typewriter was sold by them second-hand around 1930. The paint on the typewriter has been touched up a bit, so I think someone may have traded it in for newer model and Taylor's refurbished it and sold it again. When Corona launched this model in 1912 they sold like hot cakes. Corona, a new entrant in the typewriter business, found that the world was waiting for an easy to use portable typewriter. Corona was still making Corona 3s in New York in 1941 when America joined the Second World War. So why did the Corona 3 have such a long production run, and why were they still desirable enough for a shop in upmarket Holborn to refurbish them and sell them second-hand? The answer has a lot to do with the lightness of the design and being the first Corona was able to define what a portable typewriter should look like. Fifteen years before this machine was made, the typewriter was the hot piece of technology that was revolutionising business life. Every self-respecting business man needed his correspondence to look professional. Machines of the era were expensive, heavy and tied to the office. At around that time New Yorker Frank Rose had the imagination to see people using typewrites on the train going to work, at home , up mountains or anywhere they chose. He put his mind to designing a portable writing machine that would sell to the public as well as to business. Although he was struggling with ill heath, he filed a patent for a typewriter with a folding carriage on 11 February 1903. That patent was granted just over a year later on 8 March 1904. A decade earlier, George Canfield Blickensderfer designed a revolutionary typewriter which anticipated IBM's golf ball typewriter from the 1960s. The Blickensderfer typewriter had a cylinder which rotated when you pressed a key to ink the correct letter and press to the paper. It supported interchangeable typefaces and revolutionary keyboard layouts and was much smaller than the office machines of the time. However, the quirky design was a little too advanced for the typewriter market of the early 1900s and the Blickensderfer, or Blick had only modest success. It was Rose's design which eventually succeeded. Tragically he died before it could go into production, but his son George was able to secure funding for the idea on Wall Street. The first commercially successful portable typewriter went into production as the Standard Folding Typewriter in 1908. It was finished in unpainted aluminium and looked very different from most people's idea of a typewriter. American businessman and Senator, Ben Conger, saw the potential of the new machine and bought out the company and patents in 1909. He trusted a young Swiss engineer, Otto Peterman, who was already working for the Rose Typewriter Company to improve the design and take Rose's invention to the next level. The first stage of that development was the Standard Folding Typewriter number 2. Probably in an arranged publicity stunt former US President Theodore Roosevelt took one on an expedition to Africa. Otto Peterman made some more significant improvements to the Standard Folding Typewriter for 1912. The new machine was now a shiny black colour. It had gained a small amount of weight over the all aluminium original. He changed the front plate to pressed steel, probably to save cost, but cast aluminium for the rest of the body giving it a more rounded look. Ambitions to take the portable typewriter worldwide needed a new name. Standard Folding would hardly trip off the tongue in foreign markets. So the name Corona, which means 'Crown', was chosen. 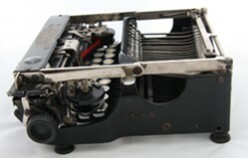 Since it was the third version of the Standard Folding typewriter, it became the Corona 3 and production started in February 1912. The newly named Corona Typewriter Company had a huge success on their hands. Sales were astronomical. The world had indeed been waiting for a portable typewriter. The Corona 3 was given a shiny black coat of paint, which conformed to the current look of office typewriters. You could take a Corona 3 anywhere: on a train, in a taxi cab, even on a mountaineering expedition. 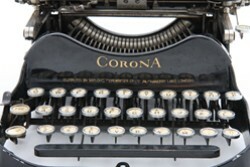 Although Corona users boarding London tube trains found they needed to pay extra to transport the typewriter. I have not found any evidence of people using them on trains, like mobile phones in the 1980s, though this would have been possible, if extremely annoying for fellow passengers. When the First World War started in 1914, the Corona 3 was the natural choice for the British and French armies. The War was good for Corona. The two giants of the office typewriter world, Remington and Underwood, were engaged in war work and unable to launch competitor products and the Corona had the market to itself for a number of years. At the time there was no direct market for such a device. The marketing men at Corona targeted both business users and domestic users. They extolled the Corona as a machine busy executives could use to type their own correspondence rather than waiting for a secretary. Equally they vigorously, and in the aggressive tone of American advertising in the early twentieth century, promoted the Corona for use at home, for letters to the bank manager, children's homework and students' essays. The Corona 3 attracted a number of celebrity users. Authors Ernest Hemmingway, Laurie Lee and Sinclair Lewis all owned Corona 3s. As did the American journalist, Ernie Pyle. Novelist Jack London bought its predecessor, the Standard Folding Typewriter as well as US President Theodore Roosevelt. Corona 3 sales continued at a pace in the 1920s and Corona gradually improved the design. However, lightness and compactness, whilst important, did not turn out to be the key selling points that Rose had imagined. When competitors entered the market their machines machines were bigger and heavier, but more functional. The Corona had a very small keyboard with only three banks of keys. You needed to press a shift key for the numbers and a 'cap' key for the capitals. The new machines from Remington and Underwood had full sized keyboards with four banks of keys as was usual for office machines. Corona claimed that all you needed were two fingers and a command of English to make effective use of the Corona 3. In reality two-finger typing is slow and frustrating and you needed to invest some time in learning to type properly. So the appeal to executives may have waned a bit after the initial rush. The market for portable typewriters satisfied both business and home users in the 1920s and 1930s. Art Deco styling joined full sized keyboards later in the 1920s and the Corona 3 began to look old fashioned. Corona's next model, the Corona 4 was larger with a full sized keyboard. Corona never developed the lightweight go anywhere portable typewriter any further. Nevertheless the appeal of the Corona 3 still lasted. 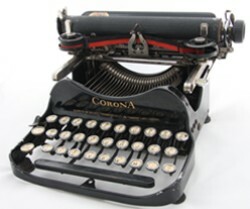 It was a favourite machine of serious writers, authors and journalists who wanted a typewriter as small and light as possible and the Corona continued to sell in smaller numbers right up to 1941 when the Second World War finally forced Corona to halt production. Although by then sales were no more than a trickle. Corona 3 was never beaten on size and weight and even twenty years after the last one came off the production line in 1941 it was still less than half the weight of modern portables. Today the Corona 3 is a lovely piece of vintage technology. People are rediscovering the joy of using a manual typewriter. Since you have to get each letter right, it gives you time to think. If you are going to own a manual typewriter there is no other machine as charming as the Corona 3. It is the original ultra portable. How old is my Corona 3? There is a serial number etched into the bottom of the base at the back of the typewriter. This can accurately tell you when your Corona 3 was made. Go to Corona Serial Numbers which lists serial numbers and some model changes. Also look out for the most obvious improvement made during the Corona 3's production run. From 1922 it had 'Fig' and 'Cap' keys on both sides. This meant that the base had to be made wider to accommodate them. How much is my Corona 3 worth? A good working Corona 3 will be worth up to £150. Superb examples with box and instructions will be worth up to £300. Non-working models will fetch around £50 if they can be restored. "I have a Corona 3 in good working condition.The serial number etched into bottom of the base indicates it is a 1917 make. It has 'Fig' and 'Cap' keys on both sides. How come then, you state "From 1922 it had 'Fig' and 'Cap' keys on both sides" ? "This is the model I have. I've just acquired a Corona Personal Writing Machine 3, etched number 44301. I'm having a terrible fight sourcing a ribbon for it. I do not have the original spools. Some traders on eBay do sell ribbon suitable for he Corona 3. However, you may have a problem if you don't have the original spools. I fitted a new ribbon for mine, but had to wind it onto the existing metal spool. It might be worth getting in touch with one of the dealers and asking them what they suggest.